First experience with a nephrologist . . .
would have been kinder. At this point, I can only imagine. ” — and told her, not so evenly: THAT IS THE FAULT OF KAISER AND ITS DOCTORS. She had the last — albeit silent — word: She simply left and closed the door. With authority. records of my blood tests — under my nose. our kids and their families, our friends . . . and for myself. I cook. And, I do dishes. was the same for checking symptoms, whatever. Once, obviously, was not enough for this guy. down with me already poisoned by the air in the waiting room. Despite mask. proven true that that 12.5 percent drop did ultimately mean nothing. be argued, disrespectfully — Drop Dead! Of course, he could be proved correct. But, what a delivery system for news like death! and drugs, just to remain alive. That is living? I don’t think so. But, we’ll see. you go on with living. One hopes. smoker. So much for accurate records. But, there’s more . . . Yes, his delivery was harsh. My husband’s assessment; I didn’t have words to describe it. livers, nerves. Why not kidneys? Well, maybe not when you load them up with drugs to detoxify. much sadder for an MCS patient to have to be with a doctor who just didn’t get IT! despite my clearly stated request for the earliest possible appointment of any given day. that is the case, I want my last year to be a good one, free of illness caused by drugs. products. Has anyone tried a non-drug approach? Has anyone tried to heal kidneys? so forcibly predicted by that first nephrologist. I do keep in mind that it isn’t just my creatinine readings that are high, but also the BUN. brought them in order. I hope I can stick to a strict diet and stave off death/dialysis. watermelon, et al. Too high potassium plays havoc with heart and brain. have the heart attack or stroke. 13th of April 2007. Now ain’t that somethin’? But, all this diet stuff changes in June 2007. See A scary venture: Flying in the face of medical “wisdom”. too many iced coffees? And not just iced coffee, but loaded with cream and sugar. own neighborhood when fabric softeners are used by others within blocks of our house. for so many years . . . now, by their account I’m running out of time. transplant. Or, do the dying. petrochemically derived. Why couldn’t other petrochemical-derived assaults? However, the impression given me was that I was seen as dreaming up excuses. reportedly fare better. I hope to be one. GET THE FACT THAT THE PLETHORA OF PERFUMED PRODUCTS HAS POISONED OUR AIR, OUR BODIES, OUR LAND AND OUR WATER! OUR KIDNEYS. GET IT that synthetic scents can adversely affect the cardiovascular system! the skin, lungs, liver, kidneys, also the nervous systems and brain! death. Health care WITH harm! Hippocratic Oath or is it the Oath of the Hypocrite? Of course, most doctors do not fall into the later category. Alas, some do. Caveat Emptor! former workplace. Alas, I couldn’t afford to take retirement any earlier than I did. And so goes the life for millions of others — sadly, too many are far worse off than I. When will the medical industry get it? products containing petrochemically derived fragrances, flavors, pesticides, drugs, etc. 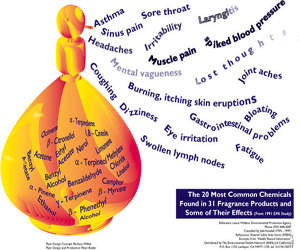 fabric softeners or other fragranced products, can and do cause my tumor to throb. incredibly fast into full scale infection with the accompanying fever and yellow green crud. Acupuncture and chiropractic saves my bacon time and again. Regretfully, Kaiser does not cover my holistic treatments, nor do they refer me out. instead of just more radiation through mammograms? But that’s another health issue. prove that, son of a gun, I do know my own body!!!!! Well, at least regarding that aspect. is chemical injury. Now, what to do about the kidneys???? flavors and fragrance industry, it will make the tobacco industry look like small potatoes. Will I live long enough to see my words ring true? cannot hear the already chemically injured over the ca-ching, ca-ching. actually contain “fragrance”? Until such time, BUYER BEWARE! Caveat Emptor! folks getting sick on products containing petrochemically derived flavors and fragrances. health. For those in the healthcare industry, or a law offices, or in government agencies, . . .
can be fired at whim. It becomes a vicious cycle. And yet, it doesn’t have to happen at all. healthcare facilities and retirement residences! There ARE safer alternatives to use. It IS all about breathing. We ALL are stakeholders when it comes to breathing. I’ll keep you posted as long as I’m around and able. Watch this space.